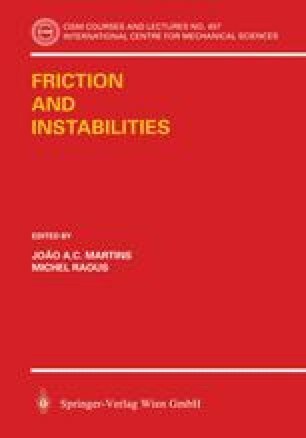 Some examples of friction-induced vibrations and instabilities of elastic structures in unilateral contact are discussed in this paper. The case of an elastic solid in contact with a moving (rigid or elastic) obstacle is considered. The onset of instability and the transition to a dynamic regime is the underlying centre of interest of the discussion. Part 1 gives an overview of some classical and basic results concerning the stability analysis of an equilibrium. The linearization method and Liapunov’s theorem are first recalled. The possibility of Hopf’s bifurcation is considered when there is flutter instability. For time-independent standard dissipative systems, the description of the rate problem and the criteria of static stability and rate uniqueness in the sense of Hill are discussed. Part 2 deals with the instability of the steady sliding of an elastic structure in contact with friction with a rigid or elastic obstacle. Closed-form solutions are discussed for some simple systems and for the problem of frictional contact of elastic layers. The possibility of stick-slip vibrations is discussed in Part 3 in an analytical example of two encased cylinders. The existence of a family of stick-slip waves propagating at constant velocity and with positive slip is discussed. Part 4 addresses the problem of brake squeal as a direct application of the theoretical analysis. This phenomenon is interpreted here as a consequence of the flutter instability of the steady sliding solution. A numerical analysis by the finite element method is performed to compute the steady sliding solution and to discuss its stability for an automotive disk brake.